28 May 2012; Toronto, Canada; Air Canada 777, flight AC001: During or shortly after takeoff, an Air Canada 777 taking off from Toronto's Pearson International Airport developed serious engine trouble which caused the liberation of several pieces of metal and led to a shutdown of its right engine. While several cars on the ground were damaged, no one on the ground was injured. After dumping excess fuel, the flight crew returned safely to the airport about 90 minutes after taking off. None of the 318 passengers and 16 crew members were injured. Canadian investigators who interviewed the pilot were told that there was loud bang from from one of the engines when the aircraft was about 1,000 feet above the ground. Several witnesses near the airport also heard an exceptionally loud takeoff, and noticed either smoke, flames, or debris coming out of one of the engines. Several pieces of metal from the right engine came down in Mississauga, a suburb of Toronto that is adjacent to the airport. 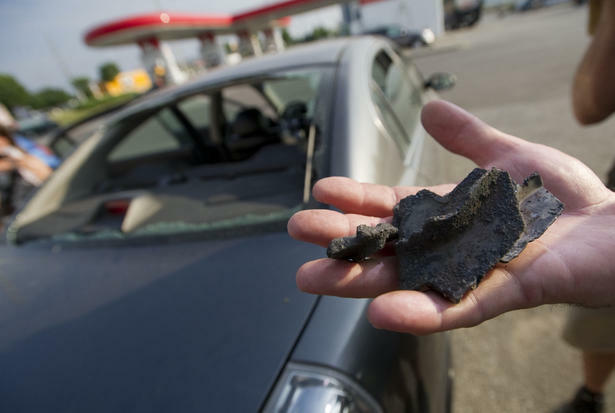 At least four vehicles at a gas station were hit and damaged by debris, including one car that had its rear window smashed. One witness stated that the debris was too hot to touch. The Transportation Safety Board of Canada will be investigating this incident, along with representatives of Air Canada and the engine manufacturer General Electric (GE). Early findings indicate that there was no damage to the front end of the engine, indicating that a bird or other object was not likely the cause of this engine failure. The Safety Board plans on releasing a written report about this incident. While parts separated from the engine, this event is considered to be a contained engine event because the liberated pieces exited through the tail pipe of the engine and did not penetrate the engine case. 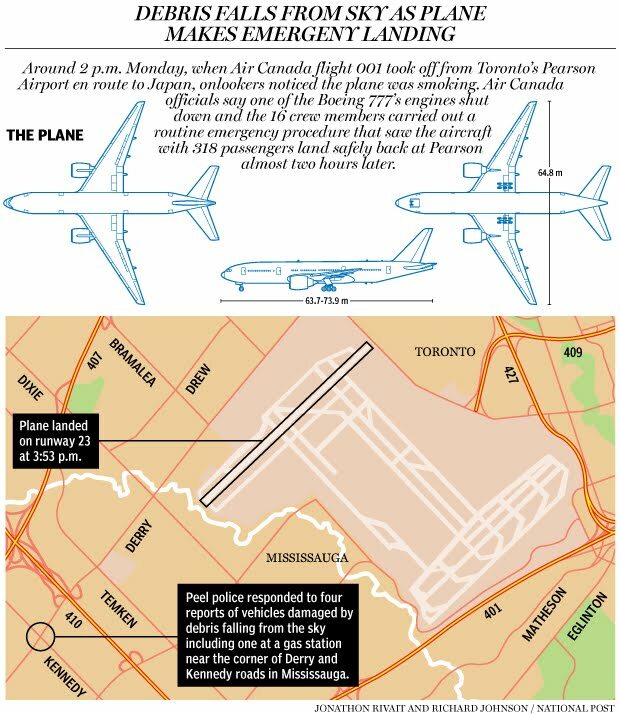 Although uncontained engine failures are considered more potentially hazardous to people in or near the affected aircraft, this Toronto incident shows that even contained engine failures have the potential to be potentially fatal to people on the ground.